Mrs May’s opinion piece printed in German media comes as the informal summit in Salzburg begins today where EU leaders hope to make progress in the Brexit discussions. 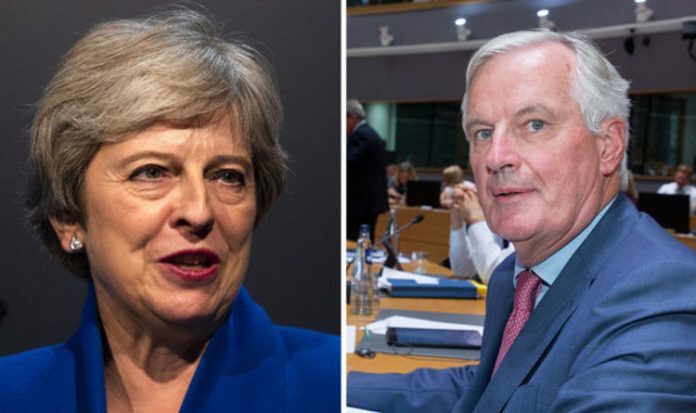 Writing in the German newspaper Die Welt, Theresa May said the EU and the UK are close to “achieving the orderly withdrawal” but said she won’t change her attitude on the Irish border. She added no country would accept the idea of erecting an “external customs border between different parts of the UK”. In Salzburg, Mrs May will set out her latest thoughts on Brexit at a dinner with all 28 leaders. In Die Welt, Mrs May said that EU heads of state and government will discuss Britain’s proposals for its future relations with the European Union at the Salzburg summit. She wrote: “The relationship between the UK and the EU will change fundamentally with Brexit, but it is very important to me that we have the strongest possible economic and security partnership, even after we leave, as I believe that this is in the interest of all of our citizens. Mrs May also said that both sides stand for the same values of “freedom, democracy and the rule of law” in a world where these values are threatened. There has still been no agreement on the Ireland border issue, which remains one of the thorniest problems of the split. Mrs May wrote: “The needs of Northern Ireland have been an important factor in the solution we have found. Ending her opinion piece in the top German newspaper, Mrs May said: “No side can demand something totally unacceptable from the others, such as an external border between parts of the UK – which no other country would accept in this situation – or that Britain should have the rights of EU membership without having the obligations. EU leaders are getting increasingly concerned of a no-deal Brexit and will organise an emergency Brexit summit in Brussels for November as they attempt to avoid it. President of the European Council Donald Tusk has warned a failure to make deal would be a “catastrophe” and was still “quite possible”. Mr Tusk sent a letter to heads of states saying: “Let me recall that limiting the damage caused by Brexit is our shared interest. Unfortunately, a no-deal scenario is still quite possible. But if we all act responsibly, we can avoid a catastrophe”.